Shoaib Akhtar's best figures - 11 for 78 - came soon after he broke the 100mph barrier. His inswinging yorkers slammed into the batsmen's feet and stumps, and put paid to any quibbling about his decision to go jet-skiing after injury forced him to pull out of the first Test. Shoaib was typically combative when remembering the performance: "Miandad [the coach] wanted to send me back but Inzamam intervened... I took 11 wickets... Miandad was all over me. I wonder if he took me for a fool." New Zealand had already lost Shane Bond and Nathan Astle to injuries, and their captain, Stephen Fleming, was also looking unlikely due to an abdominal strain. In the end he played both Tests, batting eight hours in Hamilton for 192. But in Wellington, he could do little in the face of Shoaib's frightening pace, out lbw for a duck in the third over of the Test. His bowlers gave New Zealand a 170-run lead, but the batsmen couldn't contend with Shoaib second time round either. While his reign is remembered for an entrenched hierarchy, in Inzamam-ul-Haq's first series as captain "some of the old, disruptive seniority problems had disappeared", Wisden noted. His on-field tactics weren't always inspiring, but he added 121 with Yousuf Youhana at 4.56 an over, chasing 274 to win this Test - after forgetting to claim the extra half-hour to finish the match on day four, and spending some nervous moments when rain delayed the chase on the last day. This was Moin Khan's last Test tour with Pakistan, and in Hamilton he scored his final Test hundred - a career-best 137 - a typically fighting innings, full of home-grown strokes, that steered Pakistan away from the danger of following on and helped them draw. 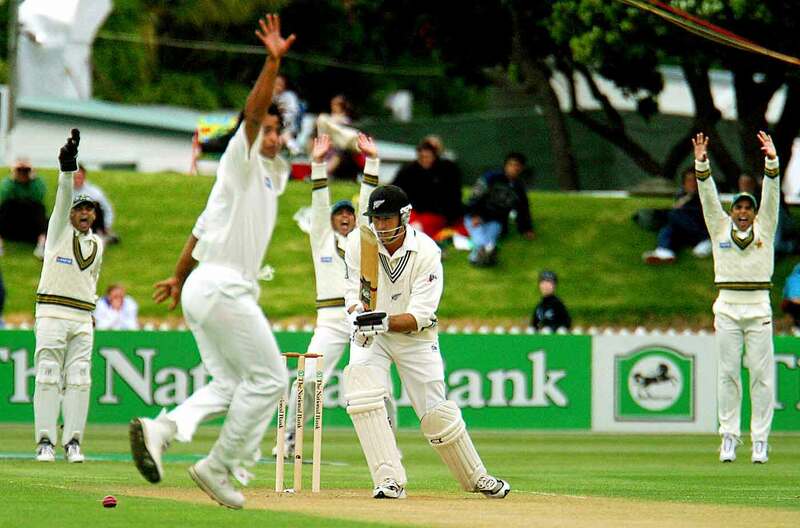 Pakistan's next series win in New Zealand came seven years later, and the only player from the 2003-04 Test side to make it back was opener Taufeeq Umar. He made 77 in three innings in 2003. In 2011, he scored 54 and 12 not out in Pakistan's ten-wicket win, this time in Hamilton, and 70 in the draw in Wellington.